Tuesday, October 30, 2018 The Door of Truth has spoken! gumi Inc has opened The Door Of Truth to transmute the collaboration of the century. 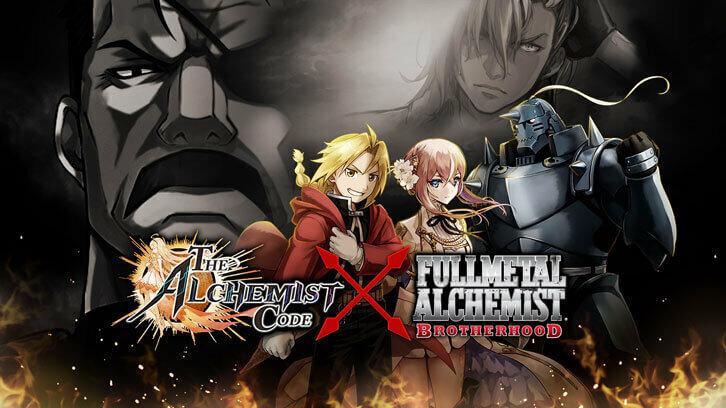 From November 1st to November 28th, fans of Fullmetal Alchemist Brotherhood will get the chance to transmute their favorite State Alchemists into the world of The Alchemist Code. What will be the cost for this Equivalent Exchange? Toritoh will be making her debut appearance during this collaboration alongside the cast of Fullmetal Alchemist Brotherhood. Toritoh is known among the Holy Order of Babel as "The General", she was raised entirely inside the church, and as a result has little understanding of outside affairs and is bad at expressing her emotions. Summon “The General” during this event and add her into your top fighting squad! Obtain the other half of the Elric Brothers, Alphonse Elric, and the shape-shifting Homunculus, Envy, for free by clearing missions and milestones! Alphonse Elric was transmuted from his world into the world of Babel by the one they called The General of the Holy Order for purposes unknown. Right before Alphonse could find out more, Colonel Mustang and Lieutenant Hawkeye broke in and rescued Alphonse from his captors. Unwilling to give up on her efforts, Toritoh gave chase to the State Alchemists. Why was Alphonse summoned? What dark secrets are the Holy Order hiding? There's even a colorful Infographic to show the achievements of The Alchemist Code players over the year!